For many hundreds of years, Dickens Heath was just a small agricultural community, situated partly in the civil parish of Solihull and partly in the civil parish of Tanworth-in-Arden. All of the development that has changed Dickens Heath from an agricultural hamlet into a modern new village has happened in little more than a decade. 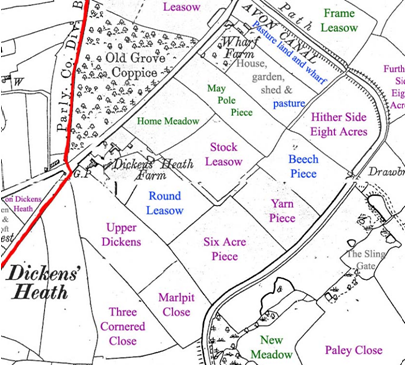 Any time travellers from the nineteenth century (or even earlier) visiting Dickens Heath in 1991 would have recognised the field patterns, farms and road layouts and would easily have been able to find their way around. Those same time travellers returning in 2001 would have been completely confused by the construction work that was transforming the hamlet they knew! It’s believed that Dickens Heath takes its name from Thomas Dykens, who was apparently living there in the 16th century. At the turn of the twentieth century, there were only a handful of households in the Solihull part of Dickens Heath, none of whom had the surname Dickens. 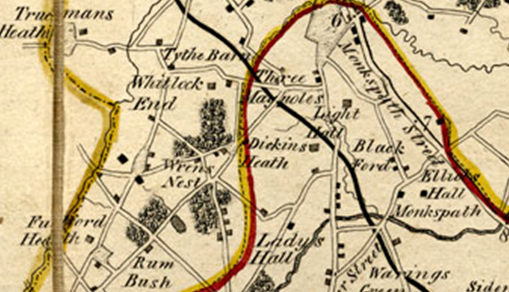 Yates’s Map of Warwickshire, 1775 notes the hamlet as Dickins Heath. The 1901 census for the Solihull parish lists only five households in Dickens Heath – the families of: Josiah and Alice Grainger; Henry and Eliza Richardson; Maria Eggington; Thomas Wells; and Francis and Alice Harris. Their occupations were all related to that of a farming community: agricultural labourer; hay trusser; drover; bricklayer’s labourer and blacksmith. There were also farming families living in the Dickens Heath area of the parish of Tanworth. Bragg’s Farm, Brickkiln Farm, Rumbush Farm, Dickens Heath Farm and Wharf Farm are all named on the 1901 census. You can see historical census records 1841-1901 for Dickens Heath at any library in Solihull. All libraries in Solihull subscribe to the Ancestry website, which is available to use free of charge from library computers if you have a library card. Contact Dickens Heath Library (http://www.solihull.gov.uk/libraries/dickensheath_10006.htm) or Solihull Heritage Local Studies Service (www.solihull.gov.uk/heritage) for further information. Many street names in Dickens Heath reflect the village’s ancient history. The tithe maps and apportionments for the parishes of Tanworth and Solihull give some wonderfully evocative field names, including: Hither Side Eight Acres; Round Leasow; Broom Leasow; Six Acre Piece; May Pole Piece; Three-cornered Close; Wren’s Nest Close; and Marlpit Close. You can see some of these fields on a composite map, produced by staff at Solihull Heritage and Local Studies Service. Maps from the 1920s have been combined and overlayed with the names of the fields as recorded in the tithe apportionments of the mid-nineteenth century. Many of these fields would still have existed in 1997, before the development of the new village started. Some of the ancient field names have been preserved in the street names of the modern village, for example: Hither Side; Round Close; Wren’s Nest Close; and Broom Lane. For almost all of its history, Dickens Heath was a sparsely populated community of fields, farms and associated workers. Most of the area would have looked very similar to this picture of fields near Bragg’s Farm, taken in 2005. Small and medium field patterns with old hedgerows interspersed with mature oak trees were a feature of the ancient Arden landscape. The seventeenth-century Dickens Heath Farmhouse on Dickens Heath Road was locally listed by Solihull Council as a building of special architectural and historical interest (DoE reference 2/320). It was described as being of “whitewashed brick and roughcast, tiled roofs. 2 storeys and 1 storey and attics, 2 gabled dormers. Lower central block has gabled porch with studded door. Taller wings, 1-storey lean-to on left. Single storey wing on far right. Lattice casement windows”. The last residents appear to have lived there during 1997/8. It had apparently been vandalised by the time construction workers moved into Dickens Heath and the farmhouse had been demolished by 2002. Some outlying farm buildings were still there in 2002 but had been demolished by 2004. These occupied the site now taken by Parkridge House and part of the village car park. The site of Dickens Heath farmhouse is now the part of Main Street occupied by the edge of the Tesco store and the adjacent building comprising a hairdresser’s and a dentist’s surgery. Dickens Heath Nature Reserve consists of 2.52 hectares of land that was formerly part of Bragg’s Farm and used for landfill. It has been converted by Parkridge Developments Ltd as part of the Dickens Heath Village development to create various habitats for wildlife and comprises wildflower meadow, wetlands, woodland and open water. New trees and shrubs have been planted and an area of open grassland has been turned into a wildlife meadow. Grass is deliberately left to grow long to encourage the dispersal of wildflower seeds. In addition to the nature reserve, Dickens Heath has two ancient semi-mature woodlands – Birchy Leasow Coppice and Tyburn Coppice. Ancient woodlands are remnants of the Forest of Arden and date from 1600 or earlier. These areas are covered by a Group Tree Preservation Order and are also designated as Local Wildlife Sites (LWS). 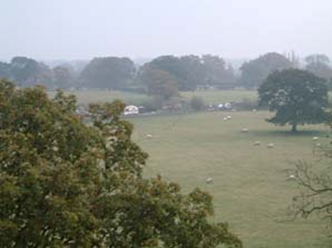 Other sites with LWS status in Dickens Heath include Tythebarn Lane Meadows, Big Dickens Wood and Little Dickens Wood. On 1st April 2009, Dickens Heath Parish Council came into existence to represent residents at a very local level. Since 1964, the area had been part of the larger Hockley Heath Parish but, in 2009, the Hockley Heath Parish Council was abolished and replaced by separate parish councils for Cheswick Green, Dickens Heath, Hockley Heath and Tidbury Green. 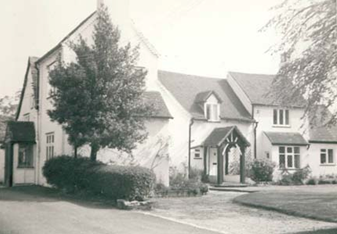 The first meeting of the new Dickens Heath Parish Council took place on 9th June 2009. The parish council commissioned the College of Arms to create a Coat of Arms, reflecting the character of the village of Dickens Heath and this was granted in October 2010. 1989 The original concept for a new village was created in response to the search for housing land to accommodate 8,100 new homes in the borough between 1988 and 2001. 1994 The Council approved a detailed Master Plan. The Master Plan was to be implemented by the consortium of developers which included Berkeley Homes, Bryant Homes, Redrow Homes, Trencherwood Homes and David Wilson Homes. 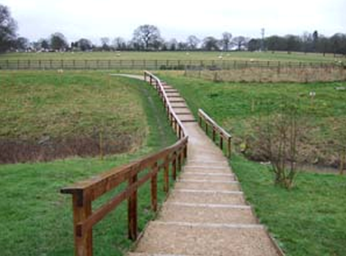 1996 The original outline planning application for the new village was approved following the completion of a legal agreement to secure the provision of roads, footpaths, community facilities and open space, including the parkland, the village green, canal walkways and the nature reserve. From the beginning, Solihull Council decided that Dickens Heath should possess the features of a traditional village, rather than just being a large housing estate in the country. The concept plan of London architects John Simpson & Partners was subsequently developed and refined, in partnership with the Consortium of Developers, to become the approved Master Plan in 1995. Do you live in, work in or regularly visit Dickens Heath? What do you think of the village? Solihull Heritage & Local Studies Service staff are particularly keen to hear from people who knew Dickens Heath before the development and from those who have moved in since. Where did you move from and why? What attracted you to Dickens Heath and what did you think when you arrived? Have your impressions changed over time?